← Bon Appetit Wednesday! St. Nicholas or Santa Claus? A Cookie Is Still As Sweet…. In the modern age, the majority of the world view Christmas as a Christian holiday in origin. However, this is not the case. A lot of popular traditions that are associated with Christmas are not indeed Christian in origin. Many have pre-Christian beginnings in pagan festivals that were celebrated by the pagan populace around the winter solstice before they were later converted to Christianity. Examples of such festivals are Saturnalia and Yule. In addition to this, Christmas was banned on a few occasions within certain Protestant groups, such as the Puritans, because they believed that Christmas was too pagan. In modern times Christmas, for those who celebrate it, is generally thought to be most people’s favourite holiday. The same could be said for the pagan winter festivals in ancient Europe. This was due to the fact that everyone was looking forward to better weather with the arrival of Spring and that there was far less agricultural work to be done at this time of year. 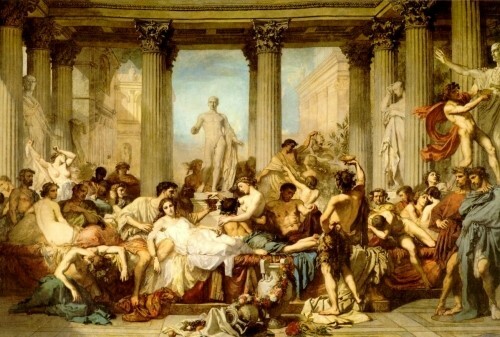 A painting by Thomas Couture depicting Romans celebrating Saturnalia. A pagan festival that gave rise to customs associated with Christmas is the festival of Saturnalia. This was an ancient Roman festival that was celebrated in honour of the god Saturn. It was celebrated mid- to late-December between the 17th and 23rd of the month. The Romans honoured Saturn by holding a sacrifice at the Temple of Saturn in the Forum Romanum in Rome and a public banquet. This was followed by frequent parties, gift-giving and a reverse of the Roman social norms such as the masters and mistresses serving their slaves at dinner instead of the other way around. Catullus, the Roman poet, described the festival as “optimo dierum” (the best of days). Unlike several Roman religious festivals that were particular to cult sites in the city, the prolonged seasonal celebration of Saturnalia in the privacy of one’s home could be held anywhere in the Roman Empire. Even after it was subtracted from the official religious calendar Saturnalia continued on through the years as a secular festival. It seems that gift-giving and merrymaking were the main customs absorbed into the Christian festival of Christmas. 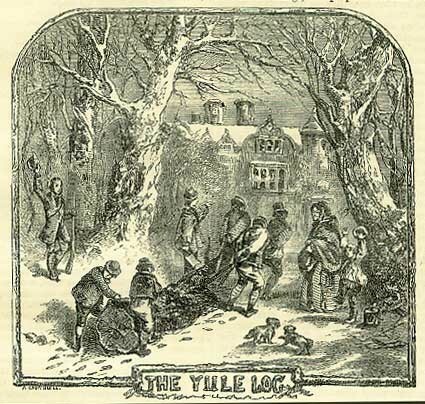 Another pagan festival that had customs absorbed into the Christian Christmas was the festival of Yule. This was a pagan festival celebrated by the Germanic people of northern Europe. While it is unknown exactly how far back the Yule festival goes, there is evidence it existed prior to the year 1000 C.E. It was held between mid-December and early January. Scholars have connected the celebration to the Wild Hunt, the god Odin and the pagan Anglo-Saxon Modranicht. 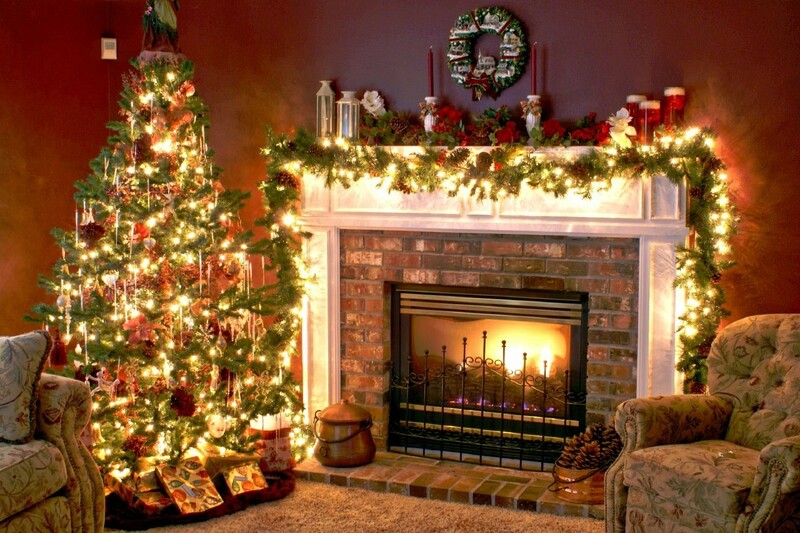 As northern Europe was the last area to be Christianised, many of its pagan traditions had a major influence on the celebration of Christmas, such as the Yule log and Koliada, a cycle of Ukrainian winter rituals, which is synonymous with Christmas carolling and festive fun on Christmas Eve. Dies Natalis Solis Invicti (the birthday of the unconquered sun) is one more pagan festival that can be attributed as a prequel to Christmas. 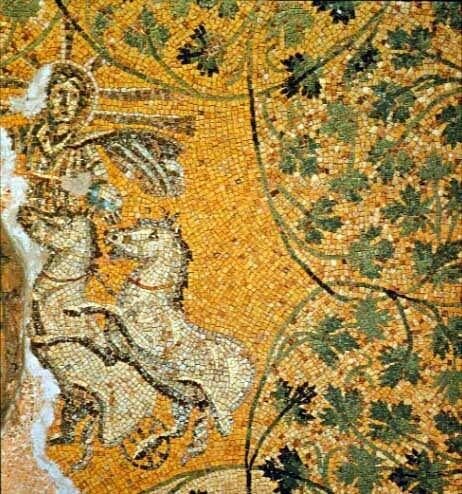 This was a late Roman festival honouring the sun god, Sol Invictus, on the 25th December. A big feast would have been held in honour of Sol. This coincided with the Christian celebration of the birth of Jesus on the 25th December. And as it would happen, many early Christians associated Jesus with the sun; according to Malachi 4:2 in the Christian Bible, Jesus was prophesied as “Sol Iustitiae” (sun of righteousness). So it can be seen why the Church would incorporate the festival of Sol Invictus into the Christmas holiday. Evidence of Jesus as Sol can be seen in Mausoleum M in the pre-fourth-century necropolis under St Peter’s Basilica in Rome. Here Jesus can be seen as “Christo Sole” (Christ the sun). As this article has shown, Christmas is not wholly a Christian invention. The Church absorbed customs and traditions from pre-existing pagan winter festivals, such as Saturnalia and Yule. Favourite Christmas pastimes, such as caroling and gift-giving, have their origins in the pre-Christian pagan populaces of Europe. What can we derive from this merging of pagan and Christian tradition? People through the ages, from many cultures, with many beliefs, shared common bonds in their celebrations: fellowship with family and friends, rituals, good cheer and giving of gifts. These traditions never go out of favour, whatever the time, whatever the place. Author: Russell Fleming has a Masters degree in Ancient History and Classical Archaeology and an MLitt degree in Ancient History from the University of St. Andrews. He wants to inspire young minds by teaching Classics and in his spare time he coaches hockey at Christ’s Hospital School. This entry was posted in Blog, Holidays, Public Life, Recreation, Religion and tagged ancient history, AntiquityNOW, Koliada, Odin, pre-Christian Germanic, Romans, Saturn, Saturnalia, Sol, yule log, Yule Tide. Bookmark the permalink.